So many fun things going on, including my week of Simmering Soup (you can read about it at the bottom of this post)! 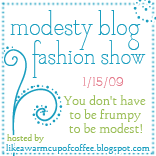 ~ My friend Sarah Mae at Like a Warm Cup of Coffee is having a Modesty Blog Fashion Show on the 15th! Isn't that great? Feel free to join in and please spread the word. She is also having a giveaway - a $25 Christa-Taylor gift certificate! Stop by her blog to get all the details and get entered! ~ I finally started doing Twitter. I resisted and resisted as I have to be careful of how much time I spend on the computer. After seeing more of my friends and fun bloggers do it, I decided to join in. I put the updates on my sidebar. If you would like to follow me, just click the link at the bottom of those updates. See you there! I'm sure you'll love hearing the most trivial information about what I'm doing - LOL! ~ Don't forget that it's "Would You Like Chocolate With That?" tomorrow (Friday)! I'll have a yummy recipe for you and you get to link up your chocolate posts - old or new - recipes, pictures, videos, etc. You can find more info here or look at last week or the week before for some yumminess. Please share the chocolate! ~ Last, but absolutely not least (!) - it's a week of soups starting on Monday! There will be: a new soup featured every day with a recipe and picture, an opportunity for you to link up your favorite soup recipes on Wednesday, giveaways and more! It will be lots of fun - do stop by! And you can start getting entries for the giveaways right now! How? 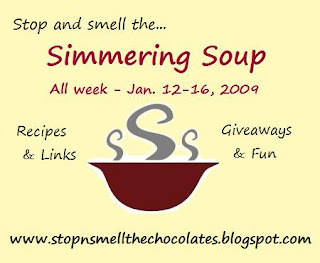 Promote my Simmering Soup week - post about it, tweet it, share it on facebook, put the button and/or link on your sidebar, e-mail people about it, etc. Just stop back here to let me know what you've done and you'll get extra entries into the giveaways next week. Thanks for helping me spread the word! Don't miss out on any of the fun! Oh I can't wait my friend. I'll help spread the word on my face book and I'll put you on my sidebar as well.You know I love to help you out! Hugs my most excellent friend. This should be great! I will spread the love as well! Can't wait for Simmering Soup week. I will definitely post a link on my blog!